Anesthetics are drugs used to block nerve conduction to prevent pain. Three types of anesthesia include local, regional and general. Local anesthetics are applied to or injected into the skin to block pain in a small area. Regional anesthetics act on a group of nerves, blocking pain sensation in a specific region of the body. General anesthetics render the patient unconscious and numb to all forms of sensation. Different anesthetics are used for each type of anesthesia and have varying durations of action. Lidocaine is a common anesthetic used for local and regional anesthesia. The medication prevents nerves from conducting electrical signals, causing a temporary loss of sensation, notes the prescribing information approved by the U.S. Food and Drug Administration, or FDA. Lidocaine is a key ingredient in over-the-counter and prescription gels, creams, lotions, sprays and ointments that are applied to the skin for relief of pain due to sunburn, shingles or other conditions. Doctors may inject lidocaine into the skin to numb an area before stitching a wound, removing a small skin growth or taking a skin biopsy. Lidocaine may be also be used for nerve blocks and other forms of regional anesthesia, including epidural anesthesia. 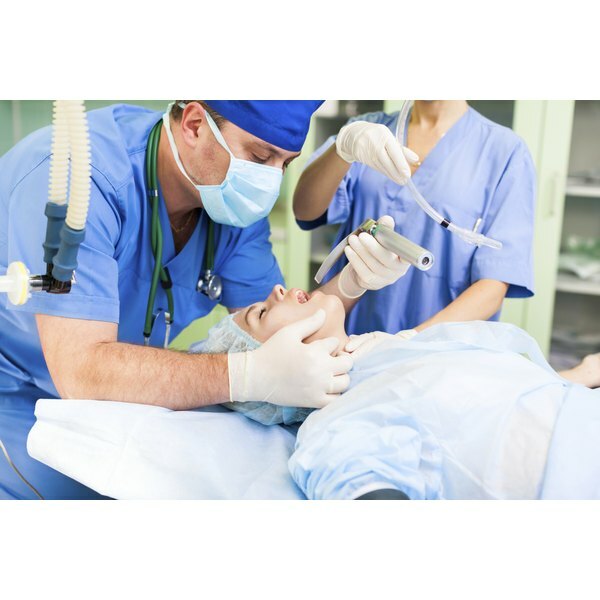 Sevoflurane is a rapid-acting, inhaled general anesthetic, which is used to put people to sleep and keep them asleep during a surgical procedure. In addition to inducing unconsciousness, sevoflurane causes relaxation of the muscles, a characteristic necessary for general surgical procedures. Sevoflurane is approved for use in adults and children, as noted in the FDA-approved prescribing information. MayoClinic.com reports possible side effects of sevoflurane include cough, increased production of saliva, nausea, vomiting, shivering, cough, drowsiness and dizziness. Propofol is an intravenous general anesthetic, which is commonly used to put people to sleep and maintain anesthesia. The manufacturer&rsquo;s FDA-approved prescribing information notes that discontinuation of intravenous infusion of the drug after a surgical procedure leads to rapid awakening in roughly 10 to 15 minutes. Propofol is also used for sedation in combination with regional anesthesia for minor procedures. This anesthetic is approved for use in children and adults. The U.S. Department of Justice Drug Enforcement Administration labels propofol as a "drug of concern" due to its abuse potential. Unlike most forms of anesthesia, which cause grogginess, people may wake up from propofol sedation with a sense of euphoria. Low doses are reported to produce a "high." In a 2007 study published in Anesthesia and Analgesia, Dr. Paul Wischmeyer and colleagues found that 18 percent of anesthesiology training programs reported having dealt with propofol abuse by staff over a ten-year period. Accidental deaths have been reported due to recreational propofol abuse.